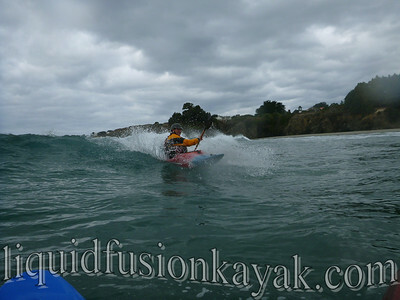 There seems to be an increase in interest in playing in the surf zone in kayaks - possibly due to the amazing photos and videos that are being shared on the web via facebook. Or perhaps we are seeing a generation of kayakers that are becoming more adventuresome in playing in the sea. Increased interest in kayaking in the surf makes us happy but also nervous. Happy because we love to play in the surf zone and teach others. Nervous because untrained paddlers in the surf zone can be a danger to themselves and others. 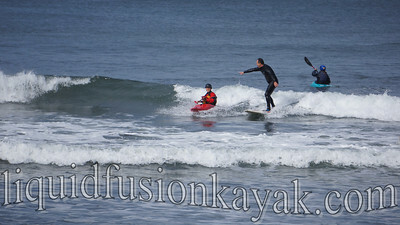 We teach 2 types of surf classes for kayakers. One is Sea Kayaks in the Surf. The focus of this class is controlled launching and landing skills which includes reading the water, positive and protective posture, timing and application of strokes, bracing and rolling, swimming in the surf with and without equipment, and surf zone etiquette and safety. Whew - that's a lot to learn and we encourage our students to take our Sea Kayaks in the Surf several times. With our coaching, their skills and confidence increase each time and we progress from small friendly surf zones to more challenging ones. Jeff coaches a paddler in for a controlled landing. 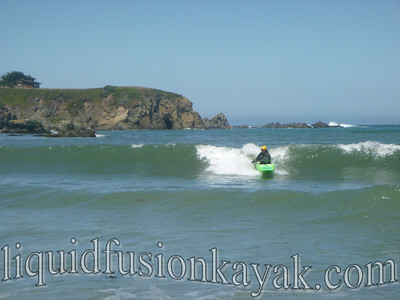 We have been teaching Sea Kayaks in the Surf during our full immersion sea kayak weekends, as private lessons, and by appointment for groups of paddlers. Six is the maximum number of students in our Sea Kayaks in the Surf Class so each paddler gets lots of individual attention. 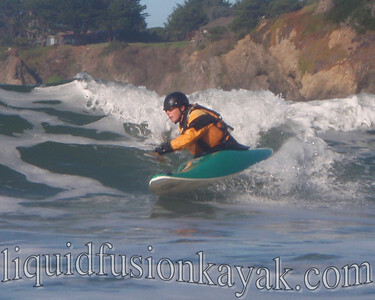 Our other surf zone classes are Surf Kayak Classes - surfing waves in a kayak. For this class, we use highly maneuverable keel-less kayaks that include wave skis, hp surf kayaks, and whitewater kayaks. This class is a lot of fun!!! Etiquette and the rules of the surf zone are emphasized as students learn strategies for paddling out, selecting and catching waves, and maneuvering on the wave. Friendly waves and maneuverable craft are FUN!!! 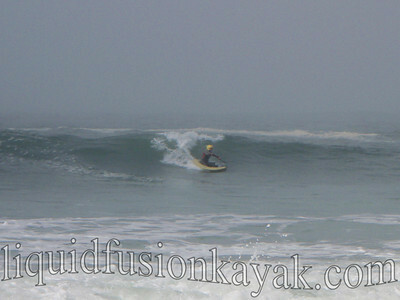 Our weekend surf classes are often on a Saturday with a Surf Kayak Safari the next day. This way students get to travel to one or more local breaks with us, practice their water reading skills to evaluate the break, and then surf with us. 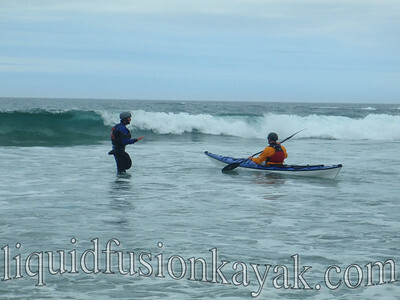 We offer private surf kayak lessons and clinics for groups of paddlers by appointment. Four is the maximum number of students in our surf kayak classes. 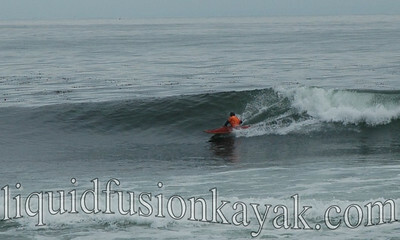 Our next Surf Kayak Weekend is March 16-17. This is a perfect tune-up for anyone interested in participating in the Santa Cruz Kayak Surf Festival as well as anyone interested in learning and surfing with us. Jim turns to stay in the sweet spot of the wave. We like the multi-day approach to instruction because we see huge gains in our students' skills over several consecutive days of instruction. 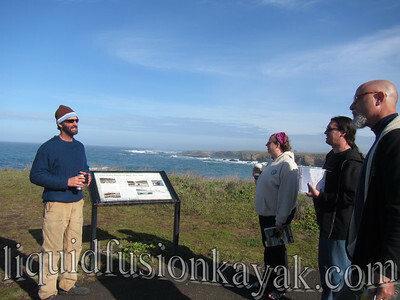 It also takes planning to get to the Mendocino Coast so we like folks to maximize their amount of instruction while they are here (remember you can get here from there and Mendocino County is an amazing place). 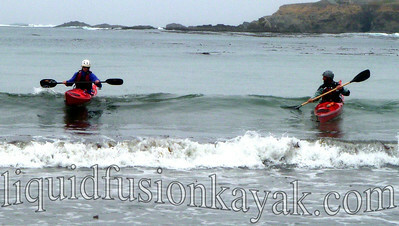 Kayak Surfing on the Mendocino Coast. Check out our calendar for a schedule of our sea kayak and surf kayak classes and give us a ring if you are interested in joining us for a class or want to schedule a private lesson or clinic for friends.